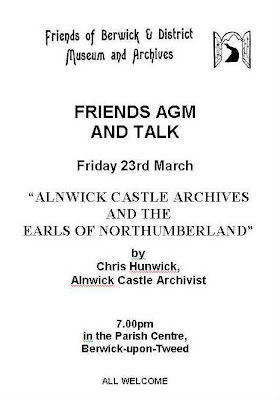 is the title of the talk at the annual general meeting of Friends of Berwick & District Museum and Archives. 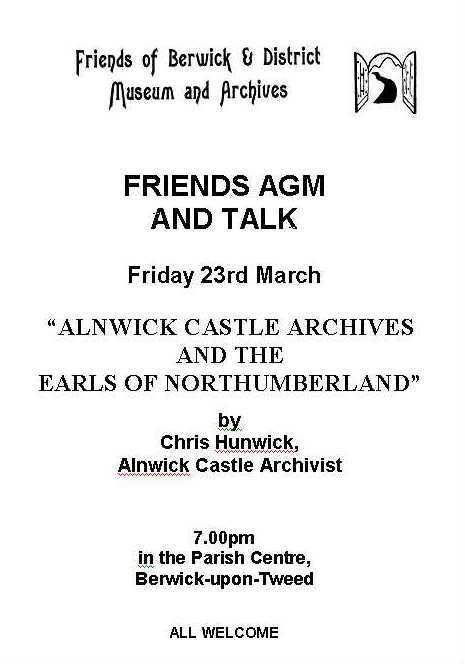 Lord Joicey will give an update on Flodden and then the speaker is Chris Hunwick, Archivist at Alnwick Castle. It takes place on Friday 23 March at 7.00 pm at Berwick Parish Centre, The Parade, Berwick-upon-Tweed, TD15 1DF, England. Map. It's next to Holy Trinity Church. Entrance is through the churchyard. The suggested car parking is in the car park next to the churchyard. Everyone is welcome. Admission free. Coldingham Monumental Inscriptions has been published. More information.